On July 20, 2016, at 2:17 am EDT, I took this snapshot of the view to the south that I have from my backyard (I was putting out the trash, and noticed pretty clouds passing by the full moon, so I got out the camera). The moon was full earlier in the evening, at 6:57 pm on July 19, and is now at 197° azimuth in western Capricornus. Up until a couple of years ago, this gap was blocked by a neighbor's tree that has since been removed. This summer, I had some good views of Mars near opposition from this location with my 80 mm apo refractor. However, general light pollution from Philadelphia (City Hall is only 8 miles away) and the surrounding suburbs, plus brightly illuminated Main Street in front of the houses at the bottom of the picture, preclude any meaningful deep sky observing from here. Taken with a handheld Canon 6D digital SLR camera and a Sigma 20 mm f/1.4 prime lens (using manual focus), which provides an 84° x 62° field of view. Exposed 1/30 second at f/2.5, ISO 12,800 in fully automatic mode; besides size reduction for the web page, no processing was applied. I also took this overhead snapshot at 1:51 am EDT with the same camera and lens (again, handheld). It's been cropped to a 16:9 ratio, 62% x 52% of the original frame size, and is centered on the Summer Triangle, showing the vertices at Vega, Deneb and Altair (mouseover for labels). This is a single frame exposed 1/13 second at f/1.4, ISO 12,800. Not a great picture, but it's interesting what can be captured with a modern, handheld digital camera and a fast lens. By July 17, 2016, Mercury had moved eastward past Venus and was now 55 arc minutes above it in the northwest after sunset as seen from Swede Run in Moorestown, NJ (nominally 40°N, 75°W). They were spotted shortly after arrival with 16x70 binoculars, Venus at 8:28 pm EDT and Mercury at 8:29 pm (sunset was at 8:26 pm). Venus was subsequently glimpsed with unaided eyes at 8:50 pm as it neared the tree tops. Mercury was not seen with unaided eyes. This image was captured at 8:50 pm with a Canon 6D digital SLR camera on a fixed tripod and a Sigma 70 to 300 mm f/4-5.6 zoom lens set to 300 mm focal length (then cropped to 51% x 43% for a field 3.5° wide x 2.0° high). Exposed 1/45 second at f/8, ISO 800. At the time, Venus was at 2°54' altitude, 11°22' solar elongation and magnitude -3.91; Mercury was at 3°42' altitude, 12°13' solar elongation and magnitude -0.95 (so Venus was 15.3 times brighter than Mercury). Mouseover for labels. On July 15, 2016, the northwestern horizon at Swede Run in Moorestown, NJ, was relatively clear for a change. As soon as I arrived, I set up the 16x70 binoculars and spotted magnitude -3.91 Venus at 8:12 pm EDT, then moments later, magnitude -1.13 Mercury , 51 arc minutes to the right of Venus, so they easily fit in the in the same 4° binocular field of view (they'll be at conjunction on July 16, just half a degree apart). At the time, they were at 9.5° altitude and the 2.78 difference in magnitude represents a 12.9 times difference in brightness. Note that sunset was at 8:27 pm, so technically, they were seen in the daytime. That's not remarkable for brilliant Venus (I've done it many times with optical aid, and even a few times with unaided eyes). However, until spotting the planetary pair yesterday evening, July 14, I had never seen Mercury in the daytime, with or without optical aid (click here for previous images of the pair in recent days). The picture above was captured at 8:36 pm when they were at 5.3° altitude and 10.5° solar elongation, so the background sky is still relatively bright. Venus is not too difficult to see, but Mercury is invisible at this scale, but it is visible in the cropped enlargement below. Taken with a Canon 6D digital SLR camera on a fixed tripod and a Sigma 70 to 300 mm f/4-5.6 apo zoom lens set to 300 mm focal length. Exposed 1/350 second at f/8, ISO 800. Mouseover for labels. This picture is a 30% crop of the image above. Both Venus and Mercury are now readily apparent (mouseover for labels). After packing up at Swede Run, I went to the meeting of the West Jersey Astronomical Society at the nearby Virtua Health and Wellness center in Moorestown. From the Virtua parking lot around 9 pm, I was able to spot Jupiter and Mars with unaided eyes (they showed a nice color difference), but clouds around the 85% illuminated moon obscured Saturn. After the meeting, the clouds had cleared the area and Saturn was visible about 3° from the moon at the 7 o'clock position (Jupiter and Saturn were seen again too). Later in the night, shortly after 3 am on July 16, I went back to Swede Run to look for Uranus (magnitude 5.8) and Neptune (magnitude 7.8). I took my 80 mm refractor, but there were thin clouds, so I just got out my 10x50 binoculars. The clouds were moving, so when openings developed, both of these two planets were easy to see and identify with the 10x50s. I confirmed them at 3:21 am (Neptune) and 3:23 am (Uranus) by comparison of their locations with respect to nearby star patterns on SkyTools charts that I had prepared. Therefore, I was able to see all seven (7) of the traditional planets overnight, plus earth of course, but not including Dwarf Planet (134340) Pluto. On June 29, 2016, the magnitude -3.9 planet Venus was spotted from Swede Run in Moorestown, NJ, with 10x50 binoculars at 8:34 pm EDT, one minute after sunset. This was my second sighting since superior conjunction on June 6, the first was on June 25 at 8:24 pm from Swede Run with 16x70 binoculars (not seen with unaided eyes on either date). This is my first picture of it since superior conjunction. Captured at 8:41 pm, when it was at 4° altitude and 6½° solar elongation, using a Canon 6D digital SLR camera on a fixed tripod and a Sigma 70-300 mm, f/4-5.6 apo zoom lens at 300 mm focal length (then cropped to 42% of the original frame for a field about 2.9° x 1.9°). It was automatically exposed 1/500 second at f/8, ISO 400, daylight white balance. Venus was imaged again on July 6, 2016. Below is a wide-angle view from the camera position at Swede Run looking toward 299° azimuth, the direction which Venus had been in the picture above (mouseover for labels, drop down for a daytime view in this direction during the transit of Mercury). Westfield Rd is running along the utility poles on the left. Captured at 8:50 pm with the 6D still on the tripod, but using a Sigma 20 mm f/1.4 lens (cropped to 54% vertically, none horizontally, so 84° wide). Exposed 1/90 second at f/4.5, ISO 400, auto white balance. On June 18, 2016, the planet Mercury was spotted from the old Mart site in Pennsauken, NJ, with 10x50 binoculars at 4:35 am EDT, 10 minutes after it rose, then it was then seen with unaided eyes at 4:40 am. It's the fifth time I've seen it during this western (morning) elongation following the solar transit on May 9th, and the first of those five that it's been unambiguously seen with unaided eyes (at magnitude -0.44). This picture was captured at 4:43 am, when it was at 3° altitude, using a Canon 6D digital SLR camera on a fixed tripod and a Sigma 70-300 mm, f/4-5.6 apo zoom lens at 300 mm focal length (then cropped to 61% x 52% of the original frame, or 4.2° x 2.4°). It was exposed 1/6 second at f/5.6, ISO 1600, 3800K. Mouseover for label. On May 9, 2016, for much of the earth, a solar transit of the planet Mercury was visible. Mercury passed directly between the earth and the sun such that properly equipped observers saw the black silhouette of Mercury's 12.0 arc-second disc moving across the sun's brilliant 31.7 arc-minute disc (so the sun appeared about 158x larger in diameter than Mercury). First contact for my location, Swede Run Fields in Moorestown, NJ (at essentially 40°N-75°W) was predicted to be at 7:13:35 am EDT, with second contact at 7:16:48 am (these are topocentric values generated by the U.S. Naval Observatory's MICA software for this latitude/longitude). Observing visually with an 80 mm apo refractor at 58x, I first noticed a slight indentation on the solar limb (first contact) at 7:14:15 am, 40 seconds later than the USNO prediction (perhaps I'm just slow on the draw, or less-than-ideal seeing at the approximate 14° altitude obfuscated the true first contact). I did see Mercury's disc separate from the inner edge of the solar limb (second contact) at 7:16:45 am, 3 seconds ahead of the MICA prediction (but judging the exact moment is somewhat subjective). Visually, the black disc of Mercury looked like a bullet hole, decidedly darker and more sharply defined than any sunspot I've ever seen. It was readily apparent in the 80 mm scope, even at 16x. Note that the typically-quoted transit times, starting with first contact at 7:12 am EDT, were approximate because they're geocentric. This picture was taken at 9:19 am with a Canon EOS 6D digital SLR camera at the prime focus of an 80 mm f/6 apo refractor mounted on a photo tripod. A metalized glass, white light solar filter was mounted in front of the objective. This is a single frame, cropped to about one-third of the original linear dimensions, that was exposed 1/2,000 second at ISO 400 with daylight color balance. There's a moderately large sunspot (AR 2542) above-left of the solar disc's center. Mercury is the darker dot roughly midway between the solar center and the lower-left limb. In this alt-azimuth view, the lower edge of the picture is parallel to the horizon, the zenith is up, north is to the upper left and east is to the lower left. Mouseover for labels. Click here or a comparison of this image with one taken a couple of hours later by Steve Mattan showing Mercury's movement. The mid-point of the transit was predicted to be at 10:57:57 am with Mercury 5.4 arc minutes from the solar center. However, the sky that had been largely clear initially was becoming increasingly cloudy. Around 11 am, a 22 degree halo appeared. This picture of it was taken handheld at 11:10 am with the 6D and a Sigma 20 mm f/1.4 lens (providing a field 84° wide x 62° high). It was exposed 1/4,000 second at f/16, ISO 400 and daylight color balance. At this point, we started packing up and left about 11:30 am, so we didn't see the last contact at 2:41:25 pm EDT. Unbeknownst to us, there would be an ISS transit of the sun at 11:48 am, visible not far from Swede Run. In fact, the centerline of the visibility path passed a mere 0.3 km from my home! Unfortunately, yours truly stupidly failed to check Cal-Sky beforehand for such an event. However, the renowned capturer of such things, Thierry Legault, had planned ahead and travelled from France to Philadelphia to catch it. His splendid image was the Astronomy Picture of the Day for May 13, 2016. 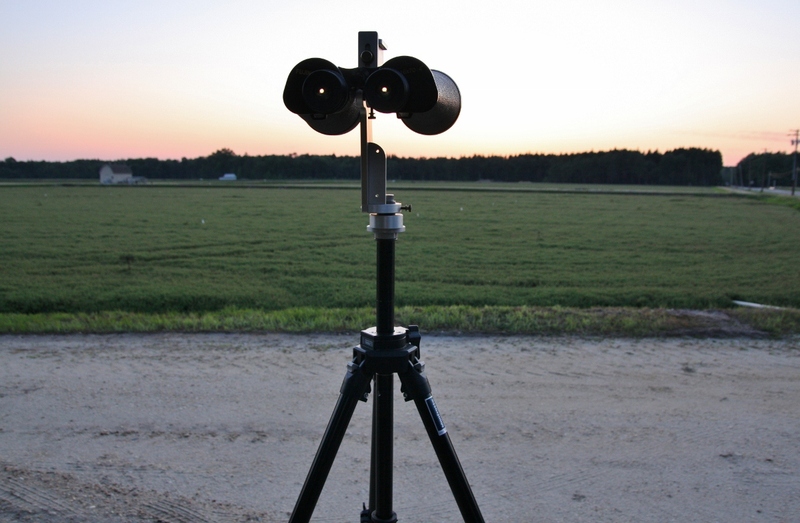 Here's a picture of the scopes set up at Swede Run for the transit. It was taken handheld at 7:36 am with the 6D and the Sigma 20 mm f/1.4 lens. It was exposed 1/320 second at f/8, ISO 100, automatic color balance. Al M. is on the right with his 80 mm refractor, a Hydrogen-alpha filter and a Canon 50D digital SLR camera. My 80 mm scope is in front of his white car. We were able to share views of the transit with several passing dog walkers. On May 7, 2016, the young Crescent Moon was 28 hours 56 minutes old at 8:26 pm EDT when this image of it was captured from the athletic field at Belleplain State Forest in upper Cape May County, NJ. Taken with a Canon 6D digital SLR camera on a fixed tripod and a Sigma 70 to 300 mm, f/4-5.6 zoom lens set to 300 mm focal length. Exposed 1/20 second at f/5.6, ISO 800. The thin crescent was initially observed with 10x50 binoculars from the southeast corner of the field at 8:01 pm (28 hr 31 min old) after Paul O. first spotted it. Within 10 minutes, it was visible with unaided eyes. We were parked near the center of the field for a public sky watch, and by time I leisurely walked back to the car for the camera and returned to the southeast corner of the field, clouds were suddenly moving in. In addition, I forgot my reading glasses, so I had trouble seeing the camera's display for live view and camera settings. This is the first of four frames hurriedly snapped off as the moon was being covered by the rapidly descending cloud bank. It was manually focused, but automatically exposed with automatic color balance. Except for size reduction, this picture is straight from the camera; no cropping was applied and no brightness or color adjustments were made.